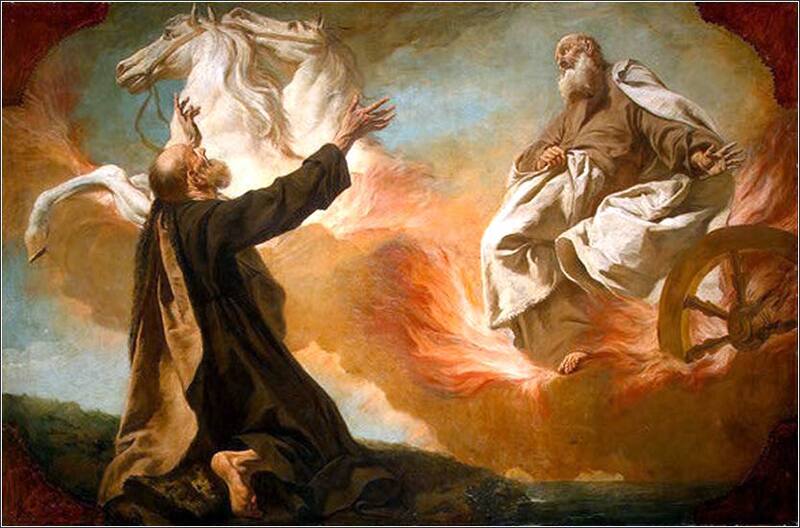 Elijah Taken Up in a Chariot of Fire by Giuseppe Angeli, ca. 1755. Elijah, Hungarian (Greek Orthodox) icon, ca. 1750. Elijah is shown twice, first standing in the dry riverbed, then in his transportation. Resolved, to examine carefully, and constantly, what that one thing in me is, which causes me in the least to doubt of the love of God; and to direct all my forces against it. 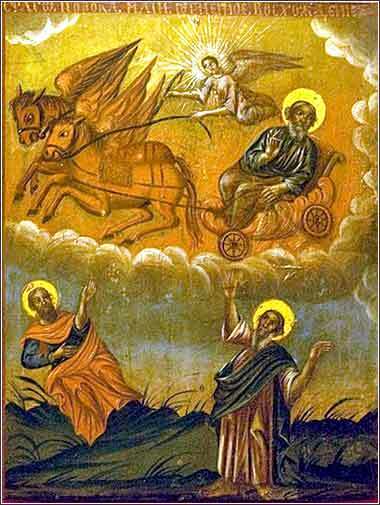 Now when the Lord was about to take Elijah up to heaven by a whirlwind, Elijah and Elisha went down to Bethel. Elijah said to him, “Elisha, please stay here, for the Lord has sent me to Jericho.” But he said, “As the Lord lives, and as you yourself live, I will not leave you.” So they came to Jericho. So the two of them went on. Fifty men of the sons of the prophets also went and stood at some distance from them, as they both were standing by the Jordan. Then Elijah took his cloak and rolled it up and struck the water, and the water was parted to the one side and to the other, till the two of them could go over on dry ground. Elijah walks all the way to the Jordan and crosses over to the east bank for his ascension. To cross it, he parts the waters. It is impossible to read this and not think of Moses. But there is a lot more of Moses in this than simply parting waters, for Moses died on the east bank, almost on the spot to which Elijah travelled. Then we must look at Elijah's route. He and Elisha first walk to Bethel, one of the two primary sites of JeroboamRemember Jeroboam? The first king of the Northern Kingdom.’s golden calves. It is a place tainted by being a center of idol-worship. It is unholy ground, not fit for Elijah's ascension. So there is good reason for them to keep moving when they reach Bethel. But why mention Jericho? It seems as if Elijah is moving backwards in time to Moses by retracing the steps of the Hebrew nation - from the current idol worship, to a place associated with Joshua's conquest of Canaan, and then back to last place Israel stood before it entered Canaan. 2 Kings does not say this, but Elijah's odd path supports an interpretation of Elijah returning to Moses and the pre-corrupt Israel. The “double portion” of Elijah's spirit refers to Deuteronomy 21:15-17, which requires that the eldest son receive twice as much of an estate as the other sons. Elijah's gift of spirit is his symbolic estate; Elisha is not asking for twice as much as Elijah has gotten. Rather, the situation is analogized to the property distribution of a dying father, with the living prophets receiving the spirit of Elijah as an inheritance; Elisha asks to be treated as the eldest son. Elisha is not meant to sound greedy; rather, he is right to think of himself as Elijah's son, and he wants God's spirit of prophecy because he desires to serve God greatly. Remember, in the Northern Kingdom at this time, God's prophets could expect to be murdered. Ahab may be dead, but Jezebel is alive, and Ahab's successors show no interest in reverting to piety. Elisha then picks up Elijah's cloak and parts the Jordan. He asked for a double portion of Elijah's spirit, but he seems to have been vested with spiritual powers equal to Elijah's own. If we look at “prophets of signs”, i.e. men who demonstrate God's existence and power by performing miracles, Elisha must be put in a category with Moses and Elijah, although most Christians have hardly heard of him.